« We’re All Wrapped Up! Thank you, Nancy, for that beautiful message. It is most fitting for the start of a new year. Blessings and love to you and Steve. You’re right: a focus on trust as a new year begins will establish our hearts and minds for whatever might be in store. Thank you for your blessing and love, Ruth. May you, too, experience God’s loving kindness throughout 2015. And please know our love flows back to you! I love your T-squared premise. It’s thorough, practical, and best of all, easy to remember. Another lovely post, Nancy! Happy New Year to you! Thank you, Rebeca. I’m praying that T-squared helps me exercise trust more consistently. Glad you liked the strategy! It is a secure feeling there is one faithful trust worthy friend, we can tell Him everything. Thanks for the post Nancy. Happy New Year to you and Pastor Steve. Miss seeing you. Indeed: ‘Tis So Sweet to Trust in Jesus, right?! I miss you, too. Laura. Thank you for continuing to be a faithful reader of the blog and staying in touch through comments. Lovely post to begin a New Year, Nancy! Some of us have Facebook friends, long-term best friends, cousins who are friends…but the most faithful and enduring…and, yes. trustworthy friend is our Lord…who has proven time and again (though our faith may falter) that He is our Solid Rock. Friends are human and will fail us from time to time, but our FRIEND Jesus not only proved himself on the Cross…he continues to encourage and lift us up during troubled times in our daily lives here on earth…because HE LOVES US, imperfect though we are. This inspires me to BE a better friend to my friends. Lots of truth in the verse from “Solid Rock.” Thank you for adding it to the conversation, Cheri. How true that Jesus is completely trustworthy for everything we need. We can never go wrong. He is our ONLY hope and stay! I really like the T x 3 quotient. I think I would put Thanks before trust that would help me focus more on the trust by creating a thankful heart first and would help me from turning back around again. I do love starting with Turn. And that Corrie ten Boom quote is one of my favorites. Thanks Nancy! Excellent point, Jean, about thanking first, in order to “prime the pump” for trust. 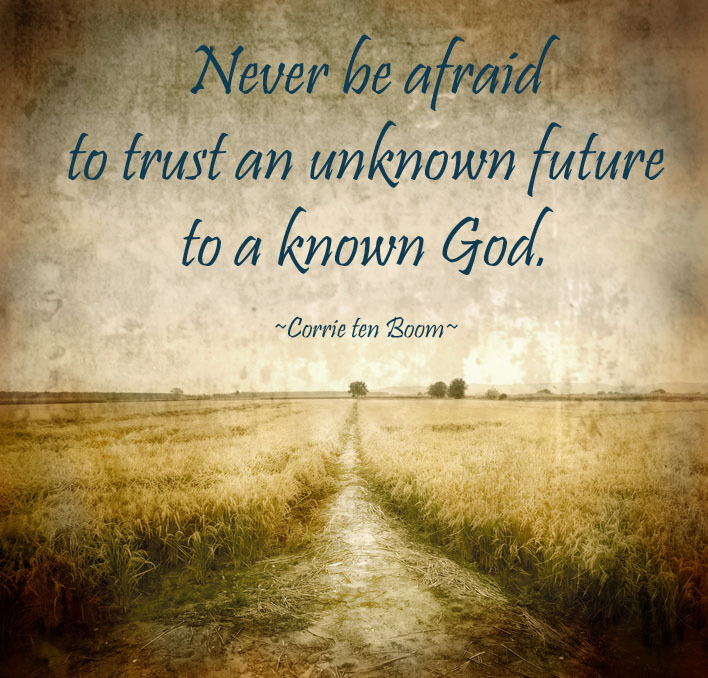 Corrie ten Boom was such a font of wisdom, wasn’t she? I miss her!